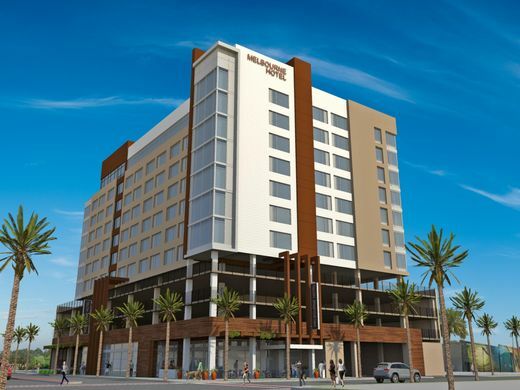 A groundbreaking ceremony may occur in June for the long-discussed “Hotel Melby,” an 11-story Tapestry Collection by Hilton boutique hotel in the heart of downtown Melbourne. Location: the parking lot at the southeast corner of Strawbridge Avenue and Waverly Place. Hotel Melby will house 156 rooms — including 24 corner suites — and a rooftop lounge featuring an indoor-outdoor terrace and 4,900 square feet of event-meeting space. The 123-foot structure will house a 170-space parking garage. The hotel will create 42 new jobs, said Doug Dombroski, Melbourne’s economic development manager. Last summer, the Brevard County Tourist Development Council projected hotel guests will spend $8.8 million per year, not including their lodging costs. Willow Street Capital, a Miami development firm, unveiled the Hotel Melby name and logo during a Thursday “sneak peek” event at a business plaza on Gateway Drive. They also offered tours of a model hotel room, describing various amenities to onlookers. “Melby is a nickname Australians use to refer to Melbourne, Australia. Melbourne, Florida took its name from the Australian city. So Melby is a nod to the founding of Melbourne, which seemed very fitting for (the) historic downtown,” said Miguel Rivera, Willow Street Capital co-founder. “We also think it’s catchy and cool,” Rivera said. The prolonged hotel project was spearheaded by Rivera and Naomi Mirsky, a husband-and-wife development team. They applied for a fiscal incentive package in February 2016 at Melbourne City Hall, triggering a drawn-out process. “Between the time that we made the application to today, we have had two kids — the older of whom is two and a half years old,” Rivera said, drawing laughs during Tuesday’s Melbourne City Council meeting. “The initial application, that I looked at today, contemplated a project that was a $19 million project. That almost seems quaint. Today, the project has increased in both scope and budget. It is a $42 million project,” Rivera said. In a project-closing vote Tuesday, the Melbourne City Council unanimously authorized a $2 million U.S. Department of Housing and Urban Development loan to help finance the hotel. The HUD loan paperwork stalled during the 35-day federal government shutdown in December and January, delaying the project. Dombroski said hotel operating revenues will repay the HUD loan, not the city. “Clearly, my wife and I, and my partners believe in this city. And this city has believed in us,” Rivera told council members. Rivera said the June groundbreaking is dependent on Florida Power & Light crews relocating utility lines at the site. The hotel could open as soon as next year. Roughly two blocks away, a tower crane is helping shape the $30 million Highline apartment complex on the old Melbourne High property. The eight-story building will house 171 apartments and a second-story swimming pool. Sam Zimmerman, the project’s South Patrick Shores developer, attended Thursday’s hotel event. “The first postmaster, Cornthwaite John Hector, was an Englishman who spent much of his life in Melbourne, Australia, before opening a general store at Crane Creek. Credited with suggesting the Melbourne name, however, was Mrs. R.W. Goode,” the website states. “Although there is more than one version of how the naming was accomplished, it appears that straws representing various names were drawn. The ‘Melbourne’ straw was the one drawn,” the website states.